It's a long story, but I finally married the Right Guy... the sweetest man I've ever met...the love of my life. We married six years ago (age 63), and the strangest thing is that when I answered his "Singles" ad, we realized that we'd gone to the same high school, and graduated in the same class! We were such different kids. He was the vice president of our class and on all the sports teams, and I was a hippie-wannabe, teaching myself guitar and learning old English ballads, starting a writer's club and scribbling out bad poetry. Our paths just never crossed. Now, in our 60's, those differences don't matter a bit; he helps me to exercise a little more and I think I'm bringing out his Inner Artist. My favorite time of the day is when we climb into bed, chatter about what's in our heads, and almost always end up giggling. This is My Sanctuary. What a wonder and meaningful quilt. You give me hope for finding a good partner! I love the details in your piece. It all works so beautifully. Just puts a smile on my face. This is so sweet! And what a good story...Congrats on nabbing a great guy, and doing a great little quilt! What a great piece! A real keepsake for sure, and I am sure your sweetheart appreciates it and how you feel. A great tribute, really to both of you. I love this piece - the detail and the story. And it gives me hope of someday finding that special someone!! I am so very glad that you found your special someone! I am envious of your giggle time. This piece makes me smile from the inside out! 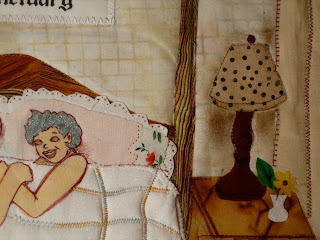 Great quilt and beautiful story! Finding your love and your giggle time are things I can now say I share with you my Obama quilt sister. It brought tears to my eyes as it reminded me of my beloved. Blessings and Gracias for sharing! Lovely story and very charming imagery. 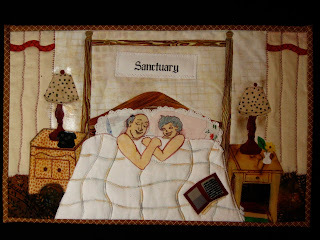 What a nice way to celebrate the sanctuary you have found with your husband! You almost didn't need to tell the story because your piece shows us the feeling of sanctuary. What a lucky couple to find each other. Very nice work. it's hard to think of anything i wish to say that hasn't already been said - how about a most gentle, warm and enthusiastic 'Ditto to all of the above'! Thanks so much for keeping me on your list!